A traverse curtain rod operates curtains with a pulley system. Once the curtain rods are installed and the curtains are connected to the curtain carriers, the curtains are opened and closed by pulling a cord. Most traverse curtain rod kits come compete with all of the hardware necessary to mount the rods above your windows. With a drill and a screwdriver you can easily and quickly mount a traverse curtain rod and hang your curtains. Measure the window to determine bracket placement. 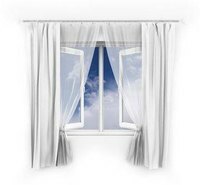 Brackets should be installed approximately 2 inches outside of the window trim and 4 inches above the top of the window. Mark the placement of the screws for the brackets with a pencil. Attach the brackets to their predetermined position by installing the hardware that was included in the bracket kit. Ideally, the brackets should be installed into studs, but this may not be possible. If studs are not available, use hollow-wall anchors to secure the brackets into the drywall. Drill holes and screw the screws into the mounting hardware and the wall. Place brackets at least every 40 inches for extra-wide window coverings. Install the curtain rod by pushing it into the brackets until it clicks. After the rod is pushed into position, secure it by turning each cam bolt with a screwdriver. Attach the tension pulley to the wall immediately under the cord opening with the provided hardware. Use the cord to open and close the carriers. Locate the knot on the master cord and pull the cord until the other side of the cord is the desired length. Tie an overhand knot and trim the excess cord at the knot. Thread the cord into the cord guide to finish the installation.